I gave oral evidence to the ‘Accountability of Civil Servants’ inquiry today, which you can find out about here. You can see the evidence session here And you can read my written submission here. 1. The civil service reform plan acknowledges “accountability for implementation needs to be sharpened”. Long-standing lack of effective accountability is one of the principal reasons for failure to meet ambition and potential in delivering outcomes. 2. If the object is an agile, innovative public service, it is very important that “implementation” be understood in terms of delivering outcomes, not merely undertaking an agreed list of tasks. That means accountability for the set of tasks undertaken being the best set, within the constraints of prevailing policy. 3. To what extent Parliament should hold officials directly to account is a matter for debate. But if officials are accountable to ministers, and ministers to Parliament, then Parliament can have a rôle in asking the minister to account for how officials are held to account. 4. The question arises as to how effective accountability of officials to ministers can be, if the consequences which flow from such holding to account are opaque. A “stronger rôle” in appointments could help to address this, subject to risks associated with “politicisation”, or with weakening the “conservator” rôle, being adequately mitigated. 5. The opportunity to influence appointments may arise only intermittently. Theoretically, ministers feed into the performance assessment of Permanent Secretaries. If this system were strengthened and seen to operate effectively, it could provide a more regular lever to improve accountability. There is a case for increased transparency here. 6. Indeed there may be a case for more transparency more generally. It is unclear why those with responsibility for advising on, or delivering, major public services should be anonymous. Televising the discussions which test how well implementation is going and what more can be done could be entertaining, informative and, perhaps, even improve the image of both politicians and civil servants. 7. A further problem for ministers in holding officials to account is the support available to them to undertake this rôle effectively. There is a case for assistance from outside the departmental management chain. Parliamentary scrutiny could provide a source of information. 8. A difficulty with holding to account for implementation in the wider sense (as distinct from policy) is the interdependence between policy and implementation. One would want a system in which those responsible for implementation felt able to challenge – formally if necessary – policy design where evidence tended to suggest this was a barrier to achieving the policy intention. Being explicit about this expectation might help. 9. The normal model is not intended to be that those involved with policy development and design disengage once a policy is adopted: one would expect the same officials to be responsible for policy “maintenance”, monitoring and evaluation. Their accountability should extend to modifying policy advice in the light of experience. 10. Ministers are accountable for policy decisions. However officials should be accountable for the policy advice they give. There is a question as to whether policy advice should be more transparent. However, without disturbing the current approach, significant elements are open to scrutiny: for example, the quality of consultation, appraisal/impact assessment and evaluation. 11. Requiring Accounting Officer sign off for implementation plans may have some symbolic value. However, one has to ask why are implementation plans not already understood to be important to the performance of a department, against which its leaders might be held to account? If defective implementation plans currently exist without sanction, will the Accounting Officer feel under any greater obligation from having signed off formally something for which he or she could already be reasonably deemed to be responsible? 12. There is always likely to be, when holding a party to account, some element of judgement as to whether the account given should lead to any reward or sanction. There is something to be said for setting out before the event the factors that would play into this judgement and their relative importance. Shortfalls in public service delivery have arisen where it has been insufficiently clear the level of ambition targeted, and what were considered reasonable lengths to which those accountable ought to have gone. 13. What if an official inherits accountability for something that is off track? It is right that where possible, the predecessor is held to account. But the successor also has a duty to assess the inheritance, flag at as early a stage as possible its problems and agree personal accountability as well. A second point – you do not refer to the possibility that the new Departmental Boards could have some impact on the accountability arrangements – especially around the “chief executive” role. They might in particular help with the problem created by the multiplicity of Accounting Officers. A bigger issue for me is the nature of the accountability. I have seen Permanent Secretaries mauled by the PAC – it wasn’t pretty but they carried on – mainly because no one really thought they they personally could have prevented the specific disaster user review. What they could have been accountable for would have been the systems used in their departments generally to control major projects and delegations of authority. 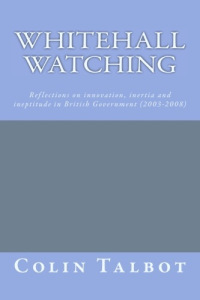 The BGI is currently pressing the PCRC of the HoC to recommend that there should be standards for policy making and associated legislation agreed between the Executive and Parliament and that Parliament should have some quality assurance mechanism – possibly a joint Legislative Standards Committee, supported by the NAO, to make sure that standards are met. Permanent Secretaries could be held accountable for the internal arrangements to meet those standards.